Fieldnotes: 10th April 2011 – The Hawthorn Sett, or, Go West, Young Man! What a beautiful weekend. Never mind spring, we’ve had a couple of days that wouldn’t have been out of place in summer. Lovely warm sun, the birds singing and the countryside coming alive. And how did I spend this gorgeous weekend? 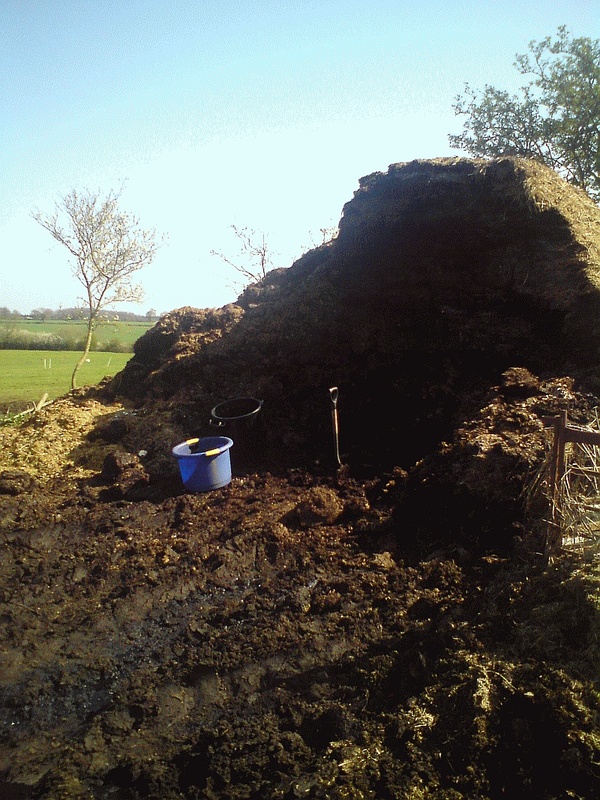 I’ve been digging manure from a dung heap at the local stables that resembled the Matterhorn in size and shape and transporting it to the vegetable garden again. My rural lifestyle seems to involve an awful lot of dung, in one way or another. If I’m not clearing it out from the chickens I’m going out and getting more for the veg. Mrs BWM was working the late shift this weekend, so the evenings have been babysitting rather than badger watching for me. But the weather was so nice I couldn’t resist taking Scarlett out for a walk. 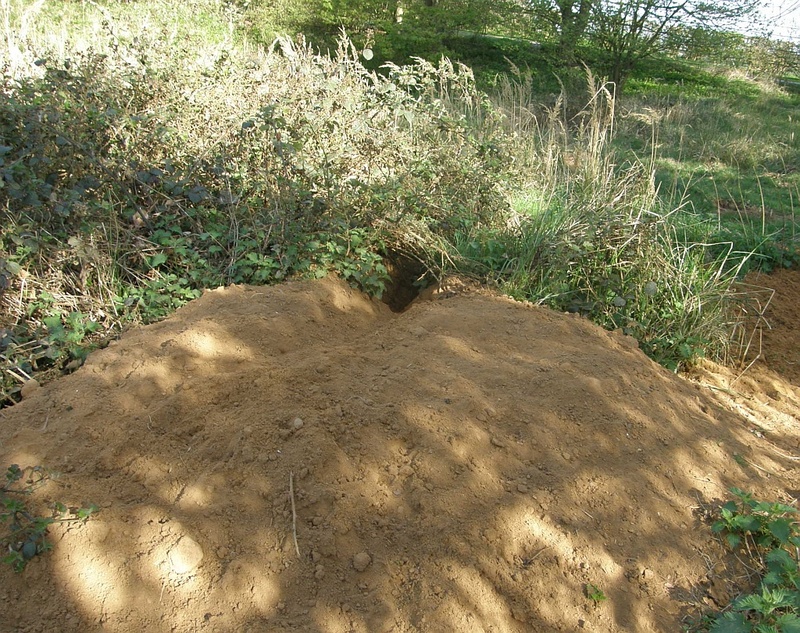 Another sett survey was in order, before the vegetation gets too high. 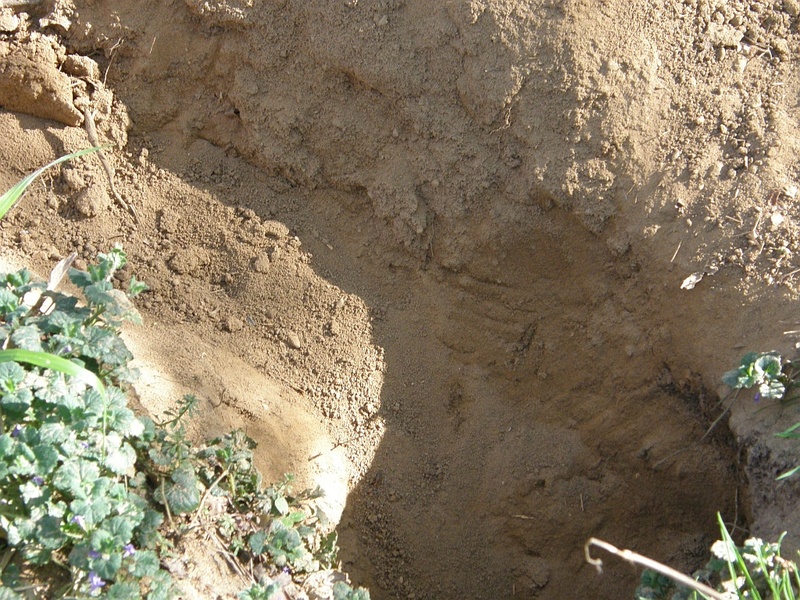 The reason for this flurry of looking for new setts is that I want to build a better understanding of the badgers at the main sett, and this means – paradoxically – understanding the badgers at the neighbouring setts. By getting familiar with other nearby setts I’ll be better placed to understand any changes at the main one, and also to judge the general well-being of badgers in the local area. I’ve focused on the the east of the main sett so far, where the Beech Tree sett is. I’ve started to doubt that the Beech Tree sett is active, but the signs all point to badgers in the area so there must be another sett nearby. To the west of the main sett, the next one is the Pine Tree sett, which seemed to have only one badger in residence for the last year or two. Today, I decided to go further south-west to the next sett along. It needs a name, so let’s follow tradition and name it after a tree. Let’s call it the Hawthorn sett. The Hawthorn sett is 500m south of the Pine Tree sett and 900m south-west of the main sett, as the badger walks. It is another sett that I’ve been aware of for a while but never examined closely. I might have been missing out, because it seems very active at the moment. I counted six active holes in a small area, plus well-used paths and latrines. The soil is very sandy and the badgers have been digging lately, leading to some impressive spoil heaps. Here’s another classic sign of an active badger sett in the picture below – old bedding that has been dug out and discarded with the spoil. 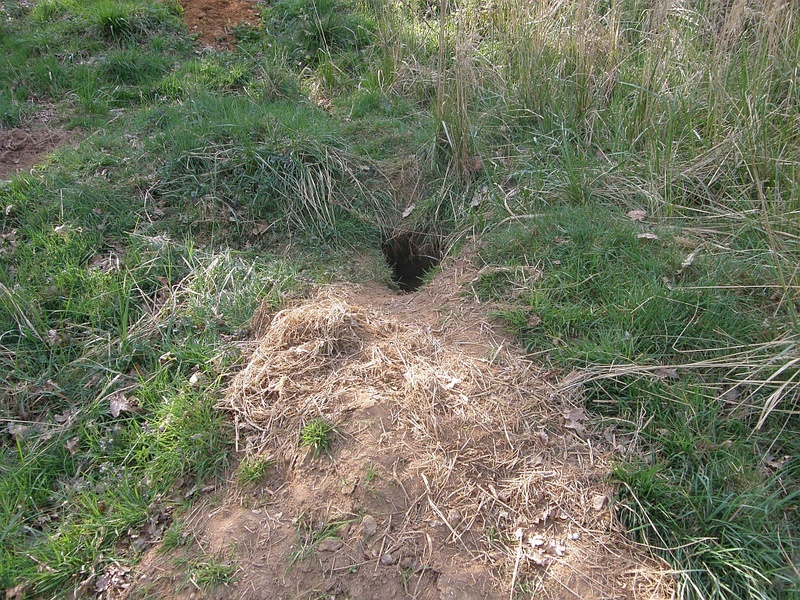 The use of bedding is a distinctive badger behaviour that you can use to tell a badger sett from a hole used by rabbits or foxes. If there was any doubt that badgers are in residence, here’s another good sign. See the claw mark in the centre of the picture below, made by the badger as it dug out the hole? This can only have been done in the last day or two – these marks wouldn’t last long in such soft, sandy soil so they must be recent. It was only a quick visit to the sett but there was enough time to see that it is home to a decent-sized group of badgers. The next step is to pay a visit one evening and see if I can count the numbers. It’ll take time to build up a full picture of these neighbouring setts but it’ll hopefully give me another piece of the puzzle.